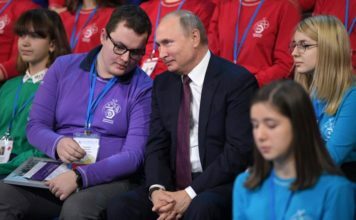 Many born during President Vladimir Putin’s 18-year-long rule, young Russians like Zabara have long been considered one of his most loyal constituents. But increasingly, the government’s anti-Western agenda and reports of widespread corruption are turning young Russians against the leader. In the decade following the collapse of the Soviet Union, street protests were led by 50- and 60-year-olds, disenchanted by the free-wheeling capitalism while their children were busy reinventing themselves in a new market economy. In 2011, when Putin announced his return to the presidency, it was the budding middle-aged middle class that took to the streets to protest what they saw as an unfair and archaic political system. But the violent crackdown on a rally in May 2012 and ensuing criminal persecutions of a dozen protesters have scared off the 40-year-olds. In the meantime, their teenage children have taken the lead. With Russia’s rigid political system offering no other outlet for discontent, young people have turned to unsanctioned street protests, ignoring official bans and unafraid of police brutality. Zabara says his parents are supportive of his activism but are too afraid to join him on the streets, fearing repercussions for their jobs. Some teenagers attended the protest with their parents. Yevgeny Roizman, who served as mayor of Russia’s fourth-largest city Yekaterinburg and is considered one of the most popular opposition leaders in the regions, said he found Sunday’s protest crowd in Yekaterinburg substantially younger than he expected. More than 1,000 people were arrested at protest rallies across Russia last Sunday. The most recent wave of anti-government protests erupted in spring 2017 when opposition leader Alexei Navalny released a YouTube expose of Prime Minister Dmitry Medvedev’s alleged wealth. The video got more than 27 million views, and Navalny’s foray into social media and YouTube blogging brought to the streets a younger, more determined and angrier generation. Emboldened by support from the youth, Navalny has been gathering supporters in central locations in Moscow and other cities, often resulting in run-ins with the police. Viktor, a 16-year old high school student who asked his last name not to be published for fear of trouble in school, said he started going to rallies last year. He believed the protest crowd is ready to go one step further. At the demonstration on Sunday, several dozen protesters charged at barriers across the road from the Kremlin and clashed with riot police. The rally fizzled out after some of them were beaten up by police and detained. In the end, some 20 protesters decided to camp out at the protest venue and spend the night there. In the morning, police officers showed up at what looked like an improvised picnic, and asked the young people to go to the police station with them. Four days later, a dozen young protesters were still roaming the streets of Moscow. Talking about the protest’s turn to violence is fraught with consequences in Russia, as law enforcement agencies have been using new draconian laws to bring criminal charges against opposition-minded youth for something as minor as a blog post or a tweet. Zabara says the protesters are willing to consider “more radical methods” and go further than their parents, adding that many young people have been inspired by demonstrations in neighboring Armenia, where the country’s long-serving president and government resigned in the face of massive street protests. He quickly added, however, that he supports a peaceful resistance. Young Russians who grew up under Putin have traditionally been one of his most ardent supporters, enjoying the benefits of a booming consumer economy and relative freedoms that their parents could only dream of under Communism. But urban youth is becoming gradually disenchanted with Putin as the state has been aggressively promoting anti-Western attitudes, patriotism and traditional Christian values — including lectures about Orthodox Christianity at schools and universities and officials assailing specific Western films or music. 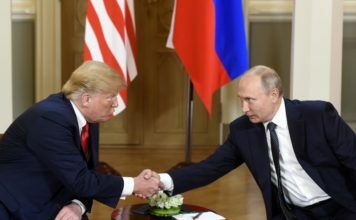 Lev Gudkov, director of the independent polling agency Levada Center, says the pollsters are beginning to see Putin’s popularity among young people wane. Gudhov said the youths who self-organize via messenger chats and get beaten up by riot police are getting a crash course in political activism — and will soon form a solid opposition when they’re older.